Think Bordeaux is just all about wine? Guess again. While wine reigns king in the World Capital of Wine, Bordeaux has always been a city also about its spirits. The city does sit between Cognac and Armagnac, after all. But these days you don’t even need to leave the city to sample spirits. Bordeaux is home to Moon Harbour, a whisky distillery producing whiskies and gin right here on the banks of the Garonne. Two Bordelaise friends with a passion for whiskies of the world opened Moon Harbour Distillery in 2014. Founders Yves Medina and Jean-Philippe Ballanger, in partnership with John McDougall (the only Master Blender and Master Distiller in the world), set out to produce the first whisky made in Bordeaux and aged in Bordeaux in Bordeaux barrels. We first met Yves Medina at Vinexpo, a trade event here in Bordeaux, a few months ahead of the official opening of Moon Harbour. Already hearing a bit of buzz about the whisky producer who’d attempt to make it in a wine world, we were interested to learn more. Homage is given to Bordeaux’s roots, the very port that played a crucial role in Bordeaux becoming what it is today, with the name Moon Harbour. The name is the literal translation for Bordeaux’s nickname, la Porte de la Lune – a nickname earned because of the crescent moon shape of the stretch of the Garonne River that passes right through the city of Bordeaux. The crescent moon is even present on Bordeaux’s coat of arms (take a look for it on Bordeaux monuments like the Porte Dijeaux and Hôtel de Ville). And perhaps most interesting of all is the choice of the distillery location. If you’ve visited the Bassins à flot quartier just past La Cité du Vin and Les Halles Bacalan, you might have wondered what the massive and hideous structure that dominates the harbor is. It’s la base sous-marine, a WWII U-boat bunker built by the Germans because of Bordeaux’s strategic position both far from the inland front line of the war and close proximity to the Atlantic. Some tourists wonder why we just don’t tear it down. Built to protect the submarines from aerial attack, the structure is massive. 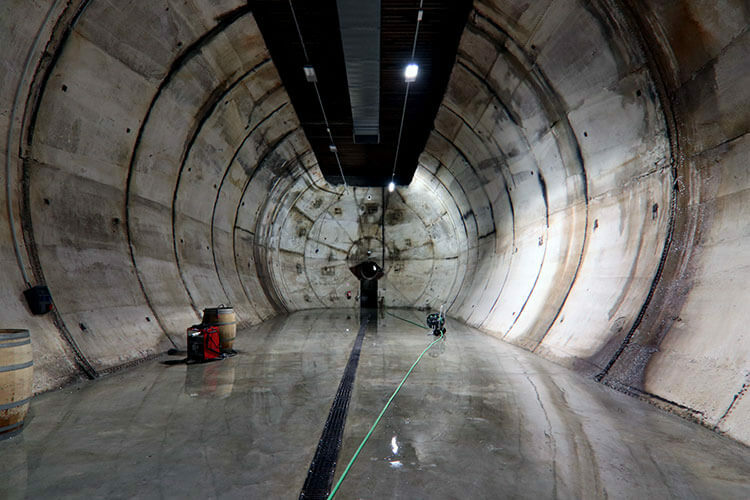 It occupies some 43,000 square meters and the roof alone is 9.2 meters (30 feet) of thick concrete. While you can see the reminders of war, the pockmarks left from attempts to bomb are a visual reinforcement that la base sous-marine is practically indestructible. Yves and Jean-Philippe grew up looking at la base sous-marine. 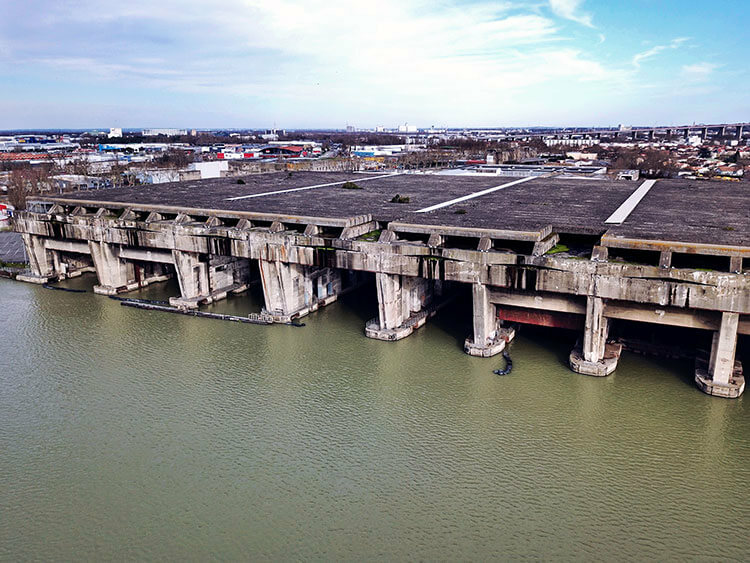 A part of Bordeaux history, they decided it rehabilitate a diesel fuel tank bunker located behind the submarine base. Never actually used to store any diesel fuel, the steel tank inside the concrete bunker was removed long ago. They decided this bunker would make a perfect barrel room for their Bordeaux whisky to age the minimum of three years necessary to produce whisky. 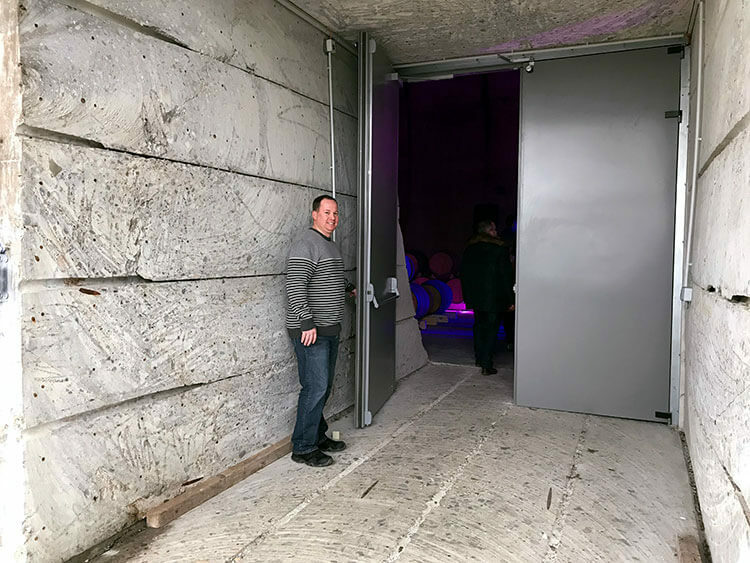 Moon Harbour Distillery was built alongside the bunker and great lengths were taken to cut a door in to the 6 meter (nearly 20 feet) thick walls of the bunker. 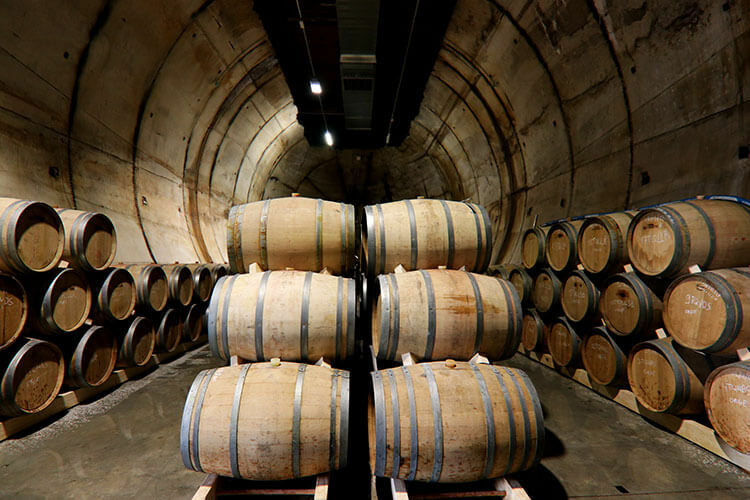 A visit to the barrel room inside the bunker is reason enough to tour Moon Harbour on a trip to Bordeaux, but their whisky and gin is a delicious allure. And everything used to produce Moon Harbour whisky comes from right here in Bordeaux. The grains are grown and harvest from Saint Jean d’Illac just 10 miles from the city center. The 11-hectoliter copper stills used to distill the whisky were built and bought from right here in Bordeaux from a company making stills since 1925. The barrels used to age the whisky come from Sauternes and the red Grand Crus of Bordeaux châteaux. 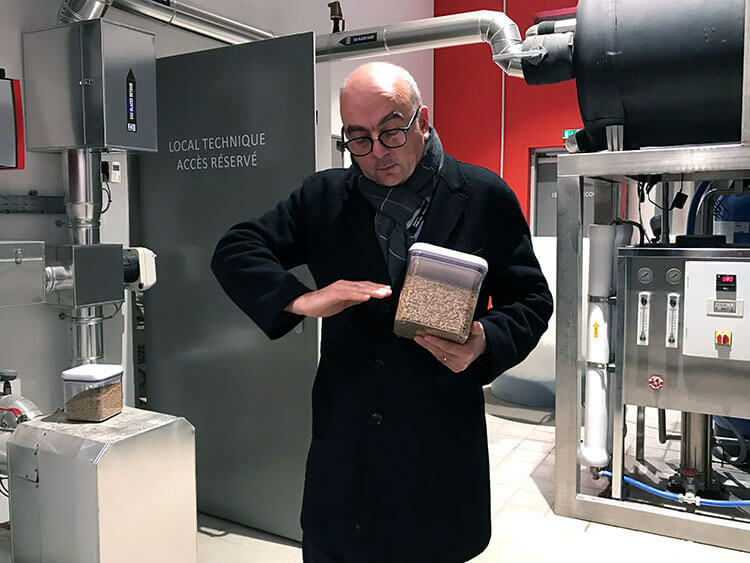 The tour is offered in English and typically it is Yves himself who guides visitors through the distillation process and facility. It’s the recipe of local grains, The STUPFLER still that requires only a single distillation and the aging in Sauternes and Bordeaux barrels that gives Moon Harbor whiskies their unique tastes. The tour ends with a sampling of Moon Harbour’s spirits: Pier 1 Whisky aged in Sauternes barrels, Pier 2 Whisky aged in Bordeaux barrels and the single distillation London Dry style gin. Of course, whisky must age for a minimum of three years to be a whisky. Moon Harbor didn’t open its doors until September 2017. 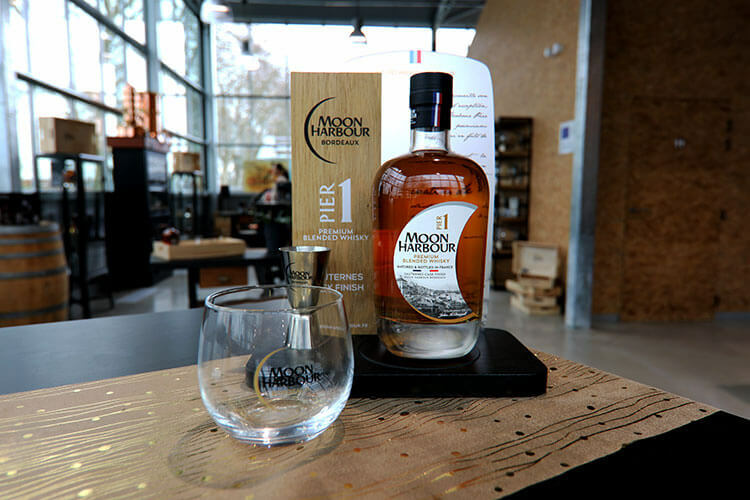 While the first official entirely made in Bordeaux whisky is currently aging in the barrels inside the bunker and won’t be ready until 2020, the first whisky by Moon Harbour was started in Scotland and finished aging in barrels here in Bordeaux. You’ll have to wait a bit longer for the 100% made in Bordeaux whisky, but you can purchase the Bordeaux and Sauternes cask finished whiskies in the boutique as a souvenir to take home. We haven’t quite honed our palettes yet for whisky, especially straight. But we have come to love gin recently and Moon Harbour’s London Dry style gin is fantastic. To make gin a gin, it has to have juniper. Then Moon Harbour has added five other botanticals: coriander, goji berries from China, kaffir lime from Réunion Island, timut pepper from Népal, and the nod to the Nouvelle Aquitaine region and Bordeaux: Espelette chili pepper from the French Basque Country. No matter whether you take a bottle home or not, the visit and tasting at Moon Harbour of these unique Bordeaux spirits is worth a place on your Bordeaux itinerary. Moon Harbour Distillery is located at 492 Boulevard Alfred Daney. From Bordeaux Center, take Tram Line B to the Brandenburg stop and then walk 1 kilometer (about 10 minutes) to Moon Harbour Distillery. Download the TBM app to plan your journey. Like Bordeaux châteaux, it is required to book a Moon Harbour Distillery tour in advance. Email [email protected] to reserve your visit in English. Visits last 1 hour and are €10 per person; visits are discounted with the Bordeaux Metropole City Pass. Visits are discounted with your Bordeaux Metropole City Pass. This article contains affiliate links. When you shop on Amazon or book on Viator through our affiliate sites, we earn a small commission at no additional cost to you. Oh my husband would LOVE to visit a whisky distillery!!! Just as you mentioned, I knew Bordeaux because of the wine but I had no idea they also make such good whisky! Bucketlisted! LOL – a whisky distillery in Bordeaux – who would have guessed. And what a lovely story! I’ll be fascinated to taste the finished goods – I don’t think a whisky really tastes good till it’s 10 years old or so! It’s so new to Bordeaux that we’ll just have to wait and see! But with a long history of spirits and distilling in Cognac and Armagnac, the results will probably be quite good. I had no idea that Bordeaux was also a whiskey destination, always associated it with wine. Great post with a documentary value. I especially like the first photo of the barrels. Well, we do have Cognac nearby so it’s not too surprisingly to now have a whisky distiller in Bordeaux. Cognac has been produced since the 16th century and this region has a long history of spirits. Of course, Bordeaux is first known for its wine. Whiskey in Bordeaux! I am completely bowled over. and the distillery and storage inside a fuel bunker ! I am over the moon at the Moon Harbor. I am not a great whiskey drinker but I must visit this place because of its uniqueness. It is definitely unique! If for no other reason, go to see the interesting setting and how this former WWII bunker has been re-imagined. Never been to wine distilleries. Interesting to know how door to bunker was built by cutting through thick walls. Makes the place look so interesting. Well captured in pics giving the idea of size. A winery and a distillery are two entirely different things as the process is completely different and different equipment is used. If you visit both chateaux and Moon Harbour, you will easily recognize the differences. I am stunned, I had no idea that whisky and gin were made in Bordeaux! I love how they have used the old harbour and put it to good use – those buildings cost so much to tear down it is much better to re-purpose it. I’m not a fan of whisky but I love gin so would be all over that! It’s not exactly possible to tear something down that was built to withstand bombing of WWII. Plus, it is a part of Bordeaux’s history so it will be a fixture of the city for the foreseeable future. But it has been interesting to watch has this area has been transformed into something new over the last few years. You are right – when I think of the Bordeaux region of France, I absolutely think about wine. Certainly when we visited, we visited many wineries. It would be interesting to see a whisky producer in this area. Moon Harbour sounds like a very different choice being in a submarine bunker. Interesting that they would be making gin too! We went to Bordeaux but I thought it was all about wine. There is whiskey too. Too bad, I would have wanted to go if I knew. Well, more reason to go back then. I love unique stories like this where they’re challenging the status quo by setting up whisky in a typically wine region. And how cool the way the repurposed the bunker. They seem so inventive and like true risk-takers! Such an amazing experience you had. How interesting what Moon Harbour of Bordeaux can offer to leave every visitors amazed. Such an interesting fact as I read this post, thanks for sharing! What a awesome post! I would love to visit Bordeaux’s Whisky Distillery. Such a great article and place to visit. Thank you so much for sharing this post. This is unique and sounds like a lot of fun! A whiskey distillery! I am not a fan because K do not drink a lot but it’s good to travel and learn more about this world and how things work. Such a cool experience in Bordeaux! I am stunned with the whiskey distillery, that a bunker was transfored into a more useful thing. This is such a good read, really enjoyed this, thanks for sharing!